Since we just celebrated Thanksgiving, we thought we'd share this chapter about the holiday in Exeter from Henry A. Shute's Plupy: "The Real Boy". It was a custom in those days which I am glad to say is practically obsolete to-day, at least in Exeter, for the children of the lower classes to spend the early hours of the night before Thanksgiving in going about the town begging for Thanksgiving supplies. The housewife of the well-to-do class would be called to the door and would find there a boy or girl who would greet her with the time honored request, “please gimme suthin’ for Thanksgiving’.” Sometimes a few kindly questions would elicit sufficient information to convince the good woman that it would be a real charity to case a little bread on the waters, and the ordinary result was that the small beggar went away well laden with goodies. Again a severe cross-examination would frequently end in the headlong flight of the mendicant and his shrill yells of derision when at a safe distance. This custom was regarded rather tolerantly by the good people of Exeter, and was not looked upon strictly as begging by those who regularly indulged in it, but rather as a fascinating game of chance. Indeed it was by no means an uncommon thing for children of the better classes to yield to its fascinations and, evading the vigilance of their maternal guardians, to solicit alms with a persistence that in any good cause would have been most praiseworthy, and a fertility of prevarication that was appalling. With these shining examples in mind it was not surprising that our young friends became interested in any project affording the alluring alternative of excitement and probable gain. And so one rainy afternoon when they gathered in Fatty’s barn and had exhausted the possibilities of “rassling,” “knocking off hats,” “punching,” and that most delightful pastime known as “pilin’ on,” in which when one of two wrestler was squarely thrown and was recumbent under the body of the victor, any boy present could by throwing himself on the bodies of the fallen and yelling, “pile on, pile on,” at once produce a confused mound on squirming, shouting, struggling boys, whose combined weight crushed the unfortunate victim almost flat, that the conversation turned to the delightful subject of Thanksgiving dainties. “What if they ketch us?” demanded Plupy anxiously. “My father would lam the stuffing out of us fellers if he should find it out,” said Whack. “I won’t do it,” said Billy Swett with decision. “I won’t unless Pewt does too,” announced Beany decidedly. The boys addressed admitted that no such injunction had been laid on them, but sagely opined that paternal relations might be a trifle strained in the event of their detection, whereupon the other boys loudly reassured them. “Aw come on now, Plupy,” said Bug, “jest think what fun it will be. You can lie so good too,” he continued. And so after much urging and specious flattery, the three worthies, Plupy, Beany and Pewt were persuaded to undertake the task, upon the other boys’ promise to go with them and hang round in the neighborhood of the houses they were to favor with their patronage. This latter arrangement was a suggestion of Fatty’s, who evidently distrusted the generosity of the three in an impartial division of the spoil. The agreement so pleased that luxurious youth that in order to show his appreciation of their noble conduct, he tip-towed into the kitchen and in the absence of the cook successfully raided the pantry and brought away a squash pie and about a peck of doughnuts stuffed into his pockets, which he distributed with the utmost impartiality. The next Wednesday evening just after supper the boys met as per agreement at Fatty’s barn and arranged for a plan of the campaign. It was deemed advisable that the initial demand should be made at the house of one William Morrill, a most worthy and kindhearted citizen, whose only failing was a belief that every man, and in fact every boy, was as honest as he. Straws were drawn for first chance and Plupy, always unlucky in games of chance, drew the shortest straw, and in high spirits the boys shinned over the fence and out through Elm to Court street, where the old gentleman lived with his sister, old Mother Moulton, the best natured, talkative old soul in the town. Plupy, urged on by his friends, approached the door with much diffidence, and in answer to his timid knock the door opened and disclosed the ample figure and wrinkled face of the old lady, peering at him through her iron rimmed spectacles. “Please gimme suthin’ fer Thanksgiving?” stammered Plupy, pulling his hat down over his eyes, while a row of heads peered over the board fence of the school house yard, awaiting with much anxiety the result of negotiations. “Why, bless your soul, you poor little boy. Come in, come right in,” said the kind old lady, vigorously hooking the dismayed Plupy, who tried to escape, into the room. Thus urged, the desperate Plupy shamefacedly removed his hat, and as he was perfectly well known to the old lady, she instantly recognized him. “Sakes alive, Harry Shute, if it ain’t you. What in the world are you up to such doin’s as this for?” she demanded sternly. Now if Plupy had told her frankly she would have laughed and let him go, but abashed at his position and somewhat terrified at her sternness, he unfortunately tried to lie out of it. “For massy sakes, child, what is the matter? Is anyone sick,” snapped the old lady, on fire with philanthropic zeal. 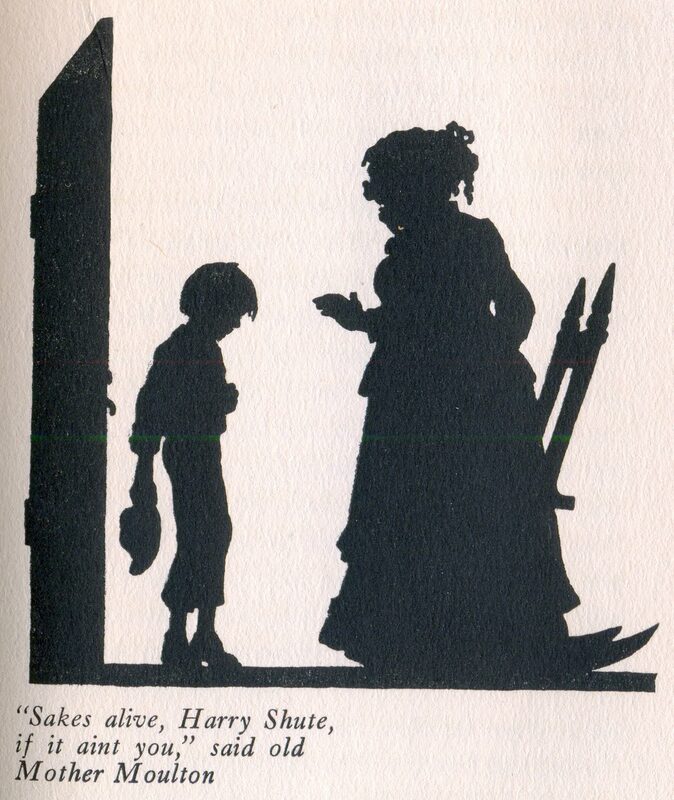 “Well, Harry Shute, I allus did think you was no-account sort of boy, but you have got a kind heart, a kind heart,” quavered the old lady, wiping her eyes on the corner of her apron. “I’m going right straight down to your house and see your poor dear mother,” she continued, greatly to Plupy’s discomfiture, who knew that interesting developments would result from her visit. “I don’t believe mother could see you to-night for she went to bed with a awful headache,” said Plupy, lying desperately and shamelessly. “Well, well, well,” said the old lady, “they are going to have an awful hard time now. Hum, hum,” she continued as she packed two mince pies nearly in paper, and filled a paper bag with cookies, and urged them upon the shrinking Plupy, as with many kind words of encouragement she led him out and closed the door behind him, and returning for her shawl and bonnet, made a hurried round of visits through the neighborhood, freely imparting the information that George Shute had lost his place in the Boston Common House, and what he would do to support a wife and seven children she for her part couldn’t imagine, and what was going to become of them all she didn’t for the life ‘o her know. Upon his return to the boys, Plupy was greatly troubled over the magnitude of his lies, but the reassuring flattery of the boys and the appetizing smell of the provender soon put him at his ease. Pewt having drawn the middle straw next applied at the house of George Smith on Elliott street. Unfortunately Pewt was of so ambitious a nature as to desire above all things to tell a bigger story than Plupy had, and as he was not recognized by Mrs. Smith he began to pour out a pitiful story of how his father and two sisters were down with the small pox, and was elaborating further and harrowing particulars, when he was told to leave or she would have him arrested, the door was slammed in his face with great violence, and a few minutes later a wild-eyed woman with a shawl over her head was acquainting the neighborhood that small pox of the most virulent type had broken out in town and they were all likely to take it before the week was over, and that everybody must take belladonna and fumigate their houses at once, and what would happen next she for her part didn’t know. The boys were somewhat depressed at the barren results of Pewt’s first trial, but at the next place, Mr. John Kelley’s, having concocted an equally pitiful but less dangerous recital of a poor father dying with consumption, he so excited the kind hearted hostess that he came away with a whole roast chicken and an apple pie. It was now Beany’s turn and at the first place he applied he invented a wholly original story. As he was not recognized, he took the opportunity of representing himself as the son of a beloved pastor of the Second Congregational Church, and to disarm suspicion, further informed her with engaging frankness that his father had not been paid any salary since May, and that they couldn’t have any Thanksgiving. 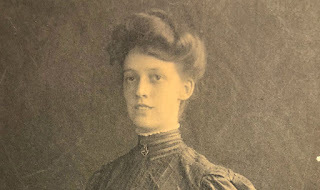 Now as this good woman was an ardent supporter of the First Church of the same denomination, and inasmuch as veiled but bitter rivalry had for years existed between the two churches, she lost no time after she had dismissed “the pastor’s little son” laden with good things, in putting on her shawl and acquainting the prominent members of the church that the pastor of the Second Church was actually in need of the necessities of life, that his salary hadn’t been paid for a year, and that for her part she should think that people who held their heads so high as the Second Church people had better pay their minister. That she always thought they were upstarts and that now she knew it. Now while the boys, affluent in dainties, were hugely enjoying their feast in the rear of Fatty’s barn, the most sinister rumors were flying through the little town, to the effect that George Shute had lost his place in the Boston Custom House under very suspicious circumstances, that several cases of small pox had been discovered and that one or two deaths had already occurred; and of the extremely humiliating position in which the pastor of the Second Church was placed by the inability of the parish to meet the demands upon it. 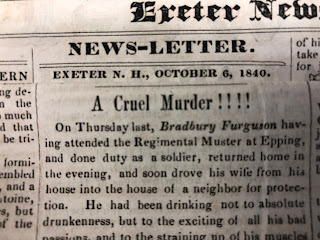 Three such disquieting rumors were sufficient to stir the whole community to a boiling heat, and great was the amazement of Plupy’s father the next day at receiving many visits of condolence from his friends, all of whom had already sent in written applications for the supposedly vacant office. And great was the annoyance of the pastor of the Second Church a most independent and high minded gentleman, at receiving many donations and offers of financial aid from members of the alien congregation. But the feelings of the harassed and much abused slectmen after spending the early hours of the forenoon in trying vainly to locate the infected district, and to suitably fumigate and effectually quarantine the same, were beyond language vitriolic enough for adequate expression. Indeed for a long time the source of the information was unknown, but the promised visit of good Mother Moulton gave the first clue to the elder Shute, who promptly acting on this clue elicited from the terrified Plupy sufficient information to implicate Pewt and Beany and they with their respective fathers were promptly summoned to a conference, at which the full nature of their atrocious doings were divulged. It is doubtful if those three miscreants ever spent a more unhappy day. That they lost their Thanksgiving dinner, which they had for weeks looked forward to was bad enough, but to be obliged to spend the greater part of that day accompanied by irate parents, in making reiterated apologies and explanations to their victims and the friends to whom they had imparted the information gained, was bitterness itself, and the sound and deserved thrashings they each and everyone received formed the culminating tragedy of a sorrowful and memorable day.